One of Rotary’s Areas of Focus is Basic Education and Literacy - please understand literacy is a key ingredient for full participation in our society. Rotarians in District 7780 are engaged in literacy projects, enable people to gain access to essential information, and generate positive connections among diverse groups, which are vital to improving community relations and promoting peace. This year, John LoBosco, our District Governor, challenges all clubs to build and/or maintain Little Free Libraries in the communities they serve. The Little Free Library program started with a model of little schoolhouse built by Rotarian Todd Bol of Hudson, Wisconsin in 2009. He wanted to praise his mom, a teacher who loved reading. He filled the little schoolhouse with books and installed it on a post in the front yard. It did not take long and in 2010 the Little Free Library program was established with the goal to exchange books and bring neighbors closer and make a positive change in the community. Since then the organization continued to grow and collaborated with organizations such as International Literacy Association and Rotary International. Just to name a few examples, the Rotary Club of Bath Sunrise raised funds for a Little Free Library by volunteering at Bath Heritage Day and the Rotary Club of Saco Bay Sunset implemented a Little Free Library program in Old Orchard Beach. The Rotary Club of Sanford-Springvale implemented a Little Free Library program in collaboration with Goodall Library and found a unique way by using old newspaper dispensers as a Little Free Libraries. Little Free Libraries come in all shape and forms. The cost could range from $50 to $500 because budgeting a unit depends on several variables such as the cost of construction, installation, and design complexity. Some of the Free Little Libraries are inexpensive and some can be great art projects for the entire family; for example, children can paint on a dresser or armoire and let their creativity run loose. 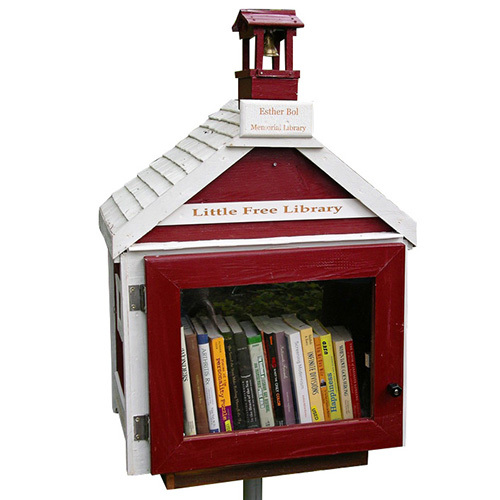 Most of us think of Little Free Libraries installed outdoors, but libraries can be placed indoors in local businesses, schools, or coffee shops, and it can be just as simple as a bookshelf, book box, or plastic tub. Please have a look at the Little Free Library page on the menu to the left. There you will find helpful tips, designs, videos - all you need to get started building your first Little Free Library.